Lt. 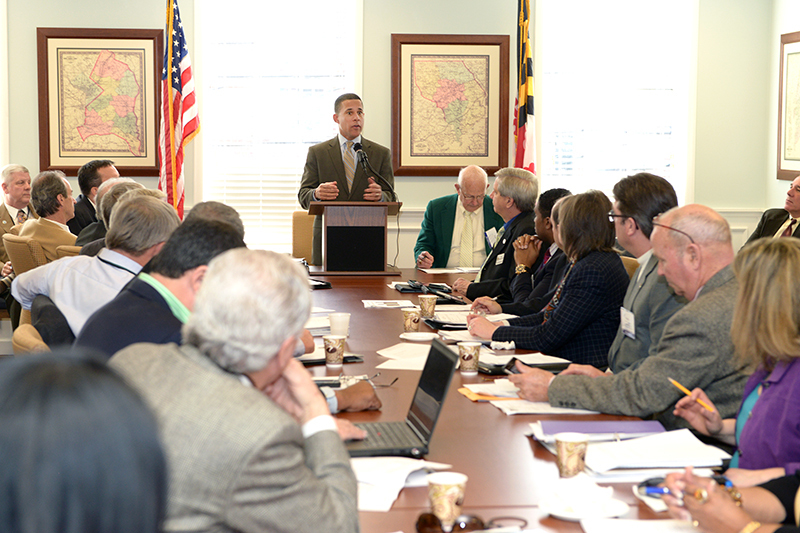 Governor Anthony Brown addressed MACo’s Legislative Committee on Wednesday, March 5 to discuss issues of importance pending before the Maryland General Assembly. Lt. Governor Brown began by thanking our local elected officials for their service and for working in partnership with the Administration. He then discussed the Administration’s priorities for the session. A major initiative of the Lt. Governor’s is the expansion of Pre-K education. He commented that a modest step is being taken in the fiscal 2015 budget towards mandatory Pre-K and that he hopes that by 2018, half-day Pre-K will be instituted across the state. He would like to have full day Pre-K in place in 2022. As Pre-K is expanded, he said we should leverage non-profit early childhood providers. The Lt. Governor also commented on raising the minimum wage and the administration’s domestic violence package. Note: An original version of this article inadvertently left the impression that the Lieutenant Governor supported the long term use of pension funds to resolve the state budget shortfalls. The error has been corrected, and the correct phrasing (…it is his hope that “pensions are not looked to to balance the budget in the future.”) appears above. MACo regrets the error.